Few experiences compare to the joy of camping: a full day of enjoying the wilderness followed by delicious food and great stories around the fire. Then when the sun dips below the horizon, you get to retire to the tent and let the wonderful sounds of nature lull you into sweet slumber. It sounds like such an idyllic experience, but depending on where you live, the summer heat inside that tent can be unbearable and ruin the whole trip. You could forgo the tent – sleep under the stars or leave the rain fly off, but you’re risking bug bites and getting soaked in summer rainstorms. Many people add fans to their setup, hoping a little extra airflow will be enough to sleep at night. If nighttime temperatures are hovering around 80 degrees or more though, no amount of air movement will keep you comfortable. For that, you’ll need a tent air conditioner, and once you’ve tried one, there will be no going back to those sweaty nights. Here are our top 5! This air conditioner is about as simple as they come – it’s the same window mounted unit that you might have in your house right now. If that’s true, and you don’t mind moving it around, feel free to take it on the road because it’s an excellent and inexpensive option for cooling down your tent. This particular model from Frigidaire has a 5,000 BTU cooling capacity, which is on the lower end for compressor units, but it should be enough to keep a large, single room, 10 x 15-foot tent cool through the night. However, if you’re hoping to hang out there during the day, it probably can’t keep up with your cooling needs. While it’s not too heavy at 41 pounds, it is a window unit, so you’ll have to lift it and move it around without the aid of wheels. The unit is fairly quiet for a compressor unit and as long as you don’t have your head directly in front of it, the noise shouldn’t be a problem (51 dB). However, unlike some of its competitors, it doesn’t have a remote so you will need to get up to change any of the settings. Ultimately, the Frigidaire is a good choice for campers that have easy access to an AC outlet (it uses a fair amount of power), don’t need tremendous cooling capacity, and would like a unit that is both inexpensive and can be used in their home if needed. When it comes to quality portable, compressor-driven air conditioners, it doesn’t get much better than the Tripp Lite. With 12,000 BTUs of cooling capacity, you should have no trouble cooling even the largest of tents in the hottest weather. The Tripp Lite utilizes an innovative design feature, expelling the condensation that forms during the cooling process through the exhaust vent air. This means you’ll never need to empty a wastewater reservoir or have to run hoses to drain the unit outside the tent. Along with that, the unit only weighs 35 lbs., making set up a cinch - exactly what you’d hope for with a portable air conditioner. However, this air conditioner is not without its drawbacks, the first being that it was not designed for outdoor use, but rather for cooling small areas like computer server rooms. As such, it doesn’t have the most rugged case, and you’ll want to be sure you handle with care. Secondly, it requires quite a lot of power, even compared to other portable, compressor-style air conditioners. You’ll need an electrical source capable of pumping out 15 amps of current, which is more than some battery systems can provide. Lastly, it’s very expensive, costing around twice as much as other portable air conditioners. If you’re willing to spend the money and need a highly portable unit with great cooling capacity though, this could be the right tent air conditioner for you. Everyone likes versatility with their camping equipment, so what could be better than an air conditioner that’s also a cooler – enter the IcyBreeze Cooler Blizzard evaporative cooler. It looks almost identical to a medium-sized food and beverage cooler, with the addition of a fan and output hose on the top. To set this one up, you just have to fill the cooler with water, ice, and anything else you’d like to keep cold. Flip on the fan and Icybreeze claims you’ll have output that is 35 degrees cooler than the surrounding air. Admittedly, this statement is somewhat misleading because it doesn’t mean all of the air in the tent will be 35 degrees cooler. Only the area directly in front of the unit is cooler, so it functions more like a personal air conditioner (though it should cool anyone lying next to you on the mattress). That being said, you have to love the portability of this unit, weighing only a little more than a cooler and running on battery power. The battery only lasts a few hours, but you have to give IcyBreeze credit for producing an off-the-grid unit. Although most evaporative coolers are fairly quiet, that is not the case with the IcyBreeze. Since much of its cooling capacity seems to come from it utilizing a powerful fan (producing winds of 25mph! ), it can be a bit unnerving to sleep next to. The Blizzard might be good for campers that value portability above all else, but this evaporative cooler costs considerably more than others like it, so you’re mostly paying for the novelty of it being battery operated. The JHS is one of the better portable, compressor-driven units on the market right now and a good choice for those that need extra cooling capacity. The 8,000 BTU unit is capable of cooling down a very large tent and it also has a dehumidifier option if you just need to dry it out. It also has a programmable timer that lets you set up when the unit comes online and when it shuts off; come back from a hike, it’s already cooled down – so luxurious. You can even use a remote to control the unit; no need to get out of bed when you start to feel sweaty and have to turn the unit up. Despite being listed as a portable air conditioner, it should be noted that the unit is quite large and weighs 44 pounds. That won’t be easy to lug around the campsite, and it also has a number of vents and hoses that need to be positioned for exhaust and wastewater removal. It also uses quite a bit of power, 920 watts to be precise. If you’re connected up to a main line at an RV park, that won’t be a problem, but a generator will need to run more often with a unit like this. The JHS portable air conditioner could be a solid option for campers that value great cooling capacity and want all the bells and whistles. It’s not a great option for those looking for something with high portability or for those with limited access to power. For campers without access to reliable power, evaporative coolers are typically the best option. They use a fraction of the power of compressor units, as they only need to power a small fan to facilitate evaporation. The Hessaire MC18M is one of the most highly rated portable evaporative coolers. One of the best things about the Hessaire is how well it works in the outdoors. It only weighs sixteen pounds, so it’s not too hard to pull it out of your vehicle or move it around the campsite. It’s also got a super rugged design made from thick plastic that can stand up to a lot of abuse. That portability comes at a cost though, it doesn’t work well for cooling large spaces. Anything more than a 150 square feet and you might not even notice its running. It’s small size also means it doesn’t have a very large reservoir (5 gallons), leading to full evaporation in only a few hours. It also has the downside of being quite loud, even when compared to compressor units and other evaporative coolers. This is problematic as you can’t be too far from the unit without losing most of the cooling benefits. Many campers never consider a tent air conditioner because they’re either unaware such a product exists, or they’re not sure how to use one. Obviously, an AC unit will take up more space and have higher power requirements compared to a tent fan, but the cooling capacity will be significantly greater. Below are some of the most important things to think about when choosing your tent air conditioner. The most obvious question to ask yourself is how much cooling will you need? Look at the nighttime temperatures for your campsite: are they below 80 degrees? You probably won’t need too much cooling capacity. Most tent air conditioners have between 5000 and 12,000 BTUs of cooling capacity, which is comparable to the capacity of a window-mounted air conditioner you would put in your home. In fact, many campers will just bring their window mounted AC unit from home to cool the tent. However, tents differ from houses in that they contain no insulation. While a home AC unit may only need to run periodically to keep the room at a comfortable temperature, the cool air quickly escapes from a tent. The size of your tent is the most important factor in determining your cooling needs and it will require more capacity than a room of similar size in a house. A 100 square foot tent will require at least 5000 BTUs to stay cool. 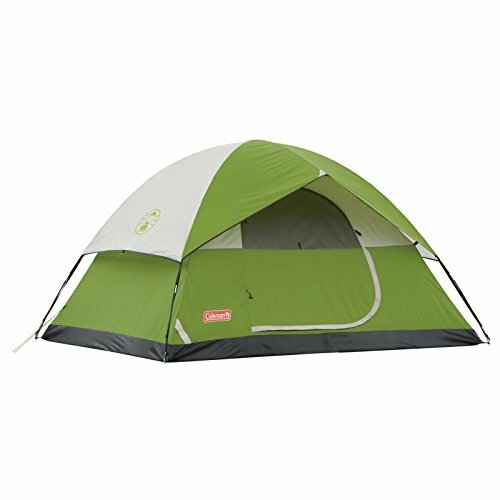 If you have something larger or will be camping in a very hot climate, choose one with even more BTUs. Humidity is just as important as temperature when it comes to you feeling comfortable in the tent. Eighty degrees and eighty percent humidity feels much warmer than ninety degrees and thirty percent humidity. When the humidity is high, your body’s natural cooling system, sweat, becomes less effective. Heat is absorbed when water evaporates, but when there’s a lot of water vapor in the air already, this prevents the sweat on your skin evaporating. Compressor-based air conditioners can reduce the humidity in your tent, which will make it feel considerably cooler even if it only drops the temperature a few degrees. This allows your body’s natural cooling system to function properly again. Another tent cooling option is the evaporative coolers, also referred to as swamp coolers. These units are only effective in dry climates though, as their cooling mechanism is similar to your own bodies, using evaporation to absorb heat from the air. These units have a water reservoir that will slowly evaporate, reducing the temperature while also increasing the humidity in the tent. Check out this informative video to get a better understanding of how they work. If you’re camping in the desert, this increased humidity will be a welcome change. However, in more humid climates, evaporative coolers are ineffective and increase the humidity to unbearable levels. Unlike home AC units, you’ll need to move your tent air conditioner more than once per season. Keeping that in mind, you’ll want to purchase one that you feel comfortable maneuvering. Tent air conditioners come in two flavors, window mounts, which are identical to the one you’d install in your home, and portable units. Window mounts need to be picked up and positioned next to the tent, so check the weight and see if it’s something you can lift. Portable units have a somewhat misleading name, as they often weigh just as much or more than window mounts. However, they’re mounted on wheels and can be re-positioned fairly easily so long as you’re not camping on rough terrain. Be aware that you’ll still need to lift the unit to put it back in your vehicle. Getting your tent air conditioner set up may be quite easy or rather complicated depending on the model you purchase. Three things need to be considered when setting up a compressor unit: power, heat output, and wastewater discharge. These units require a lot of power, so be sure you have a consistent source nearby or a long enough cord to reach one. That power-hungry compressor also creates a considerable amount of heat that needs to be vented. 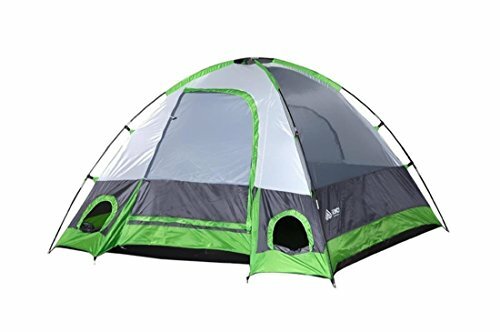 Some large tents come with a porthole for moving luggage in and out of the tent, but without such a feature, you’ll need to get creative with venting that hot air. Window units blow hot air out their backside, so be sure this doesn’t face one of your fellow campers’ tents. Portable units usually come with an exhaust hose that needs to poke out the side. Compressor units produce wastewater as part of their operation; cooler air holds less water vapor, leading to condensation inside the unit. With window units, this wastewater flows out a tube on the backside and then onto the ground. You’ll need to dig a trench for this water to flow away from the tent. Portable units collect the wastewater in a reservoir that needs to be periodically emptied - higher humidity causes these trips to become more frequent. They can also be set up to discharge through a hose like a window unit. With evaporative coolers, you’ll only need to think about how to get enough power. They don’t create much heat, use the air inside the tent, and have no wastewater discharge (though you’ll need to dump out any water that didn’t evaporate before taking the unit home). Camping equipment is all about versatility – most of us don’t go back to the same campsite every weekend (though if you love a place, more power to you! ), so it pays to have an AC unit that’s useful in a variety of conditions. All AC units will have a thermostat on them that will let you adjust output to the temperature outside. If it’s really hot and humid, you might need to run it at maximum capacity to keep things comfortable, but if its dry and nighttime temperatures are almost bearable, it may not need to do much at all. A second thing to look for is multiple fan speeds. Some people are really bothered by a high-speed fan blowing directly on them and you’ll most likely be sleeping close to the unit; it pays to have a couple of options to get yourself to that optimum comfort level. Compressor units will also often have a dehumidify option. When using this setting, the compressor will run for short bursts, utilizing a low fan speed to push humid air out of the tent and replace it with dry air. There’s no way around it, air conditioners use a lot of power. The question is simply how much power do they use, and what options do you have for providing it? Will you be camping somewhere with a power outlet like an RV park? If so, the sky’s the limit when it comes to how many BTUs your air conditioner can do. 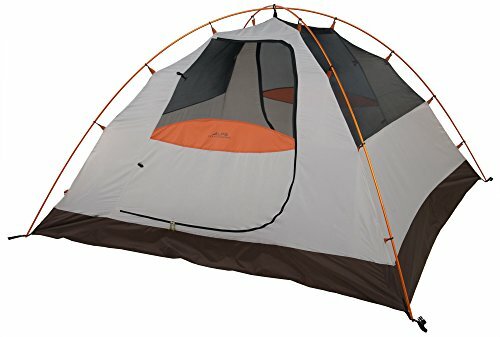 Bring a long enough extension cord and you can place your tent and it’s AC unit anywhere you want and it can be as large as necessary. One step down from that is using a gasoline generator. For the most part, this gives you the same options as RV park power outlet, however running it at night will make it hard to sleep and may be banned depending on your campsite. One of the best options for powering your tent air conditioner is to get a portable power generator. These units usually have a large lead-acid battery (the kind used in your car) and are meant to power a variety of devices for multiple days. Some power generators even sport solar panels that allow you to stay completely off the grid and recharge the unit during your camping trip (as long as there’s sufficient sunlight). These are great as they can silently provide electricity to your AC unit all night long; just be sure to compare their battery capacity to the power needs of your air conditioner. Lastly, there are a few air conditioners that can run on their own integrated battery. These are usually limited to evaporative coolers as compressors draw too much current. Even without a compressor, these units are fairly limited in their cooling capacity as the integrated battery can only power a large fan for a few hours. The right cooler for you is highly dependent on where you’re camping and how accessible electricity will be. For many campers, the Frigidaire window unit will be sufficient – it’s inexpensive and fairly easy to set up, with moderate cooling capacity. 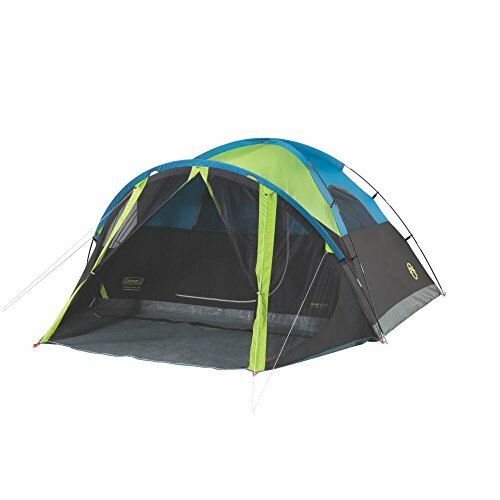 However, if you have no access to power, the IcyBreeze might be your only option to keep the temperature in the tent below sweltering. For really hot days, the Tripp Lite is probably the best thing for regulating the tent’s climate. 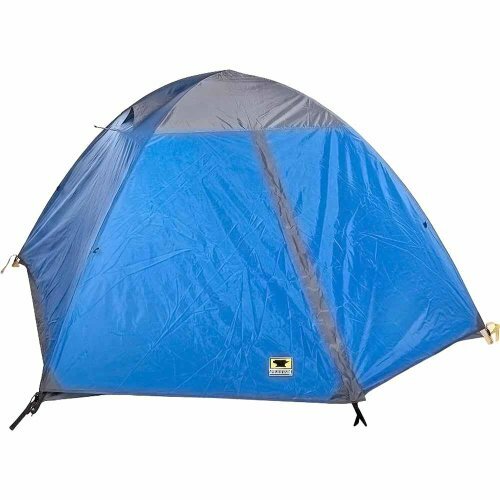 Having a tent air conditioner is somewhat of a luxury in any circumstance, and so it should be expected that it will be a bit more of a hassle than a standard tent set up. On the hottest of days though, nothing is better than coming back to your climate-controlled abode in the woods.